Threading unwanted body hair is an ancient practice that has gained popularity in the United States in recent years. The procedure originated in India and was used to clean the entire face of unwanted hair when a woman was getting married. It quickly spread to the Middle and Far East and was popular among both women and men. In Persian culture where is is called Abru Bande, (“Abru” means eyebrow and “Bande” is the thread) threading is a sign that a girl had reached adulthood. During the precise procedure, the practitioner holds up one end of a cotton thread in his or her teeth and the other in their left left hand. The middle is looped through the index and middle fingers of the right hand. The loop is then used to trap unwanted hairs and pull them from the skin. 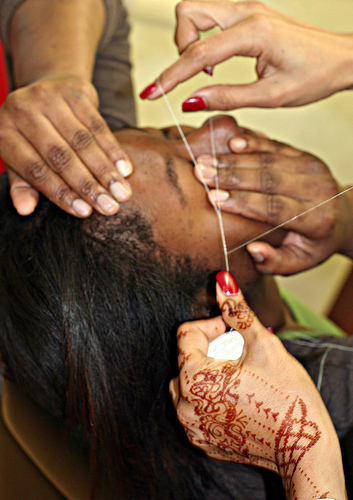 Unlike tweezing, where a single hair is pulled at a time, threading can remove an entire row of hair resulting in a straighter line. The procedure does not cause puffiness or irritation that is common with waxing and the results last for 3-6 weeks. Hairs does not need to be long to get threaded since the procedure can catch even the tiniest fine hairs. As someone who is obsessed with a clean eyebrow look, I decided to try this out. I had no problem locating a salon close to me that offered the service and the price was comparable to what I spend for a waxing session. The practitioner laid me down in a chair like one you would sit in while at the dentist, and started working. While she was threading I noticed that I was experiencing zero discomfort. I really didn’t think she was pulling anything out. The whole ordeal lasted about ten minutes and when she showed me her work I was delighted. My eyebrows were clean and defined. The procedure was painless and my skin was not red or irritated. I was charged a mere $8.00, which is actually less than what I usually pay for waxing. I am a believer now and will no longer endure painful waxing or tweezing. If you are looking for something different I highly suggest threading. The procedure will amaze you and your eyebrows will look the best they ever have.